A fraudster who swindled more than £15,000 from an elderly Alzheimer’s sufferer to pay for his wedding and gambling debts wept in court as he was handed a 20 month jail term. Last Friday at Antrim Crown Court, Judge Desmond Marrinan warned 29-year-old conman Cormac McGuckin that he faced an “inevitable” prison sentence for the “quite shocking” fraud perpetrated on a Good Samaritan and on Monday the judge saw that warning through. Ordering the married father-of-two to spend eight months in jail and a year on supervised licence, the judge told the pathological gambler he had befriended his elderly victim before abusing the trust he had placed in McGuckin. 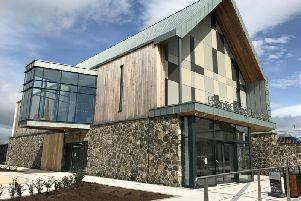 McGuckin, from Broagh Village in Castledawson had earlier pleaded guilty to two counts of fraud by false representation, 11 charges of theft and a further offence of impersonating a police officer, all of which occurred on various dates between 27 October 2012 and 29 April 2013. Prosecuting QC Roseanne McCormick had previously outlined how McGuckin’s frauds came to light when his elderly 71-year-old victim James Halliday told his son the bank had contacted him about numerous transactions on his account which had left him with a £10,000 overdraft. At the time of the offences McGuckin had been working for Pieroth Ltd, a wine ordering and delivery company of which Mr Halliday was a customer and the two men had become friends, said the lawyer. Arrested and interviewed, initially in May and again in December 2013, McGuckin claimed that Mr Halliday had agreed to loan him money but later made full and frank confessions to what he had done. Mr Doherty submitted that McGuckin was “ genuinely contrite, genuinely ashamed and remorseful” for what he had done but that he deserved substantial credit for pleading guilty at an early stage. “The sword of Damocles has been hanging over this defendant,” said the lawyer adding that knowing what sentence was likely to come had caused him additional stress. Judge Marrinan ordered him to undergo psychological treatment for his gambling addiction.